This digital-first story was printed in The Tennessean the following day. It was a quick turnaround and produced with a collaborative with a few other journalists in The Tennessean newsroom. 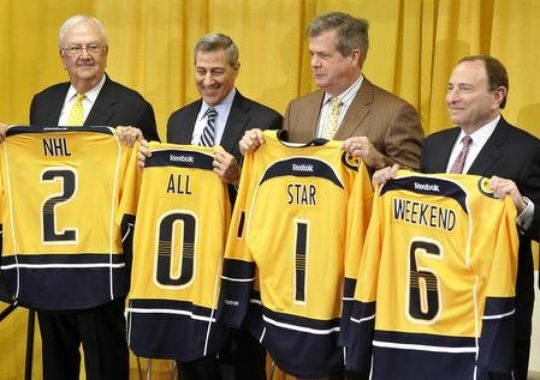 The NHL All-Star Game is coming to Nashville in 2016. The league is expected to make a formal announcement on Friday according to two sources with knowledge of the situation. The weekend’s events could mean millions to Music City and bolster hockey’s stature in Middle Tennessee. Typically held over four days in late January, the NHL All-Star Game showcases the league’s best players in the game, a skills competition and fan-friendly community events away from the arena. It can mean major business to host cities. The 2011 NHL All-Star weekend hosted by the Carolina Hurricanes generated about $11.4 million in direct visitor spending for Raleigh and Wake County, according to the Greater Raleigh Convention and Visitors Bureau. The All-Star Game comes as Nashville prepares to host 12 consecutive SEC basketball tournaments beginning in 2015, as well as the Tennessee vs. Alabama-Birmingham season-opening football game next fall. In April, the city hosted the Women’s Final Four basketball tournament, generating $20 million in visitor spending. For Nashville hotels, the event would mean hundreds of rooms for owners, team personnel and fans at a time of the year when business is typically a little softer, said Tony Phillips, general manager at Loews Vanderbilt Hotel. The city’s hotels have committed to blocking off rooms and he estimates Vanderbilt has blocked off 200 of its 340 rooms for the event. Nashville submitted bids in June to host the game in 2016, 2017, 2018 or 2019. Nashville Sports Council CEO Scott Ramsey said the city has been pursuing the event for several years. An event of this scale would entail the Music City Center for fan and youth activities, several hotels, a core of volunteers and a strong marketing plan to showcase the city to international media and national fan bases, Ramsey said. Some events at the last All-Star Game in Ottawa in 2012 included a fan fair, public night skating outdoors and concert. Bettman, Predators Chairman Thomas Cigarran, Mayor Karl Dean, Bridgestone Americas CEO Gary Garfield and Predators/Bridgestone Arena CEO Jeff Cogen are expected to be at Friday’s announcement, according to a NHL news release. Nashville is the NHL’s third straight first-time host of the event following Ottawa and the 2015 game in Columbus in January. The game will be another signature moment solidifying hockey’s stature in Middle Tennessee. The $14 million Ford Ice Center opened in Antioch in September to give the city six ice sheets and another opportunity for learning skating skills or playing hockey. Rinne said the game day experience at Bridgestone Arena could translate into a strong All-Star Game for fans and show other traditional hockey markets what Nashville hockey is about. Contributing: Dave Ammenheuser, Jamie McGee.